An artist impression of what the 78ft poles will look like at Milltown of Auchindoun. Forestry chiefs and an energy giant are on a collision course over controversial plans to build a power line through the Moray countryside. Building the 14-mile link from the Dorenell wind farm to the Blackhillock substation near Keith is expected to involve felling more than 6,600 acres of woodland. The local authority has already questioned why cables cannot be buried underground and Marine Scotland has raised fears about the impact on fish in nearby rivers. 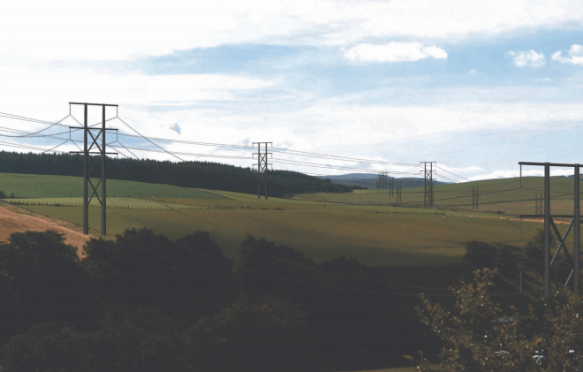 The new line would ultimately connect the turbines scheme south-west of Dufftown to the National Grid. But Forestry Commission Scotland has delivered a scathing verdict on Scottish and Southern Energy Networks’ (SSEN) proposals. The agency has made seven recommendations and highlighted 12 areas for further discussion in a letter to the Scottish Government, which will decide the fate of the plans. The Forestry Commission has raised concerns about the lack of tree replanting offered by SSEN and the impact on the economy. There are also worries the width of the corridor of woodland which will have to be levelled exceeds national guidelines, with no justification. SSEN has already faced calls to consider running the cables underground – including from Moray MSP Richard Lochhead – but insists the move would be too costly. Last night a Dufftown bed and breakfast owner also raised the spectre of tourists being put off returning to the area to enjoy its natural beauty as the power line would pass within a mile of the village. Alistair Jeffs said: “The reason people come here is to enjoy the view. Yes, whisky is a big draw but while they are here most of our guests go walking. “This is going to desecrate our woodland. There’s been a gradual chipping away at the landscape with developments. “Power lines could be one of the worst because they stretch so far. It’ll get to the point where people won’t come back. Ian Cowe, development officer for the Forestry Commission in Grampian, called for “rapid discussion” with SSEN to address the issues. He said: “Scotland’s woodlands and forestry are an economic, as well as environmental, asset. There is a strong presumption in favour of protecting Scotland’s woodland resources. “A new power line can achieve significant public benefit, but Forestry Commission Scotland expects that when transmission companies identify route corridors, they aim to minimise environmental impact and where feasible avoid areas of woodland and forestry. Mr Cowe warned he Forestry Commission could not recommend the project for approval in its current form. Engineers will use a helicopter to drop 135 of the 78ft electric poles into position to carry the cables to the 59-turbine windfarm, which is due to be completed in 2018. A spokesman for SSEN said the firm had held detailed discussions with Forest Enterprise Scotland before submitting the application. He said: “We understand that the conservancy division of Forestry Commission Scotland, which is responsible for forestry and woodland-related policy, was not aware of these discussions until formal consultation took place on our application.